Lawn mowing could be easy or tough depending on how you go about it. While some homeowners prefer using lawn care service to mow their lawn, there are others who still prefer going the traditional route of doing it themselves. If you belong to the latter group, you will find this post very useful if you are an Austin lawn owner. Most Austin grasses are usually Bermuda grass or St Augustine grass. Typically, the type of grass you have should decide how you cut your lawn grass. In this post, we have discussed 5 different Austin lawn mowing tips for the Austin homeowner. Whether you are doing your lawn mowing yourself or hiring an online mowing service, it is quite important that you pay careful attention to the height that you cut your lawn grass. Too high and you have to go over it again, too low and you can cause problems for your lawn. The recommended height to cut your lawn grass to on average should be about one-third of its height. Therefore, it is important to ensure that your mower blades are actually set at the proper height. For Austin lawn owners, it is best to cut St Augustine grass to a height of 2.5 inches and Bermuda grass to a height of 1.5-2 inches. Mowing should be done whenever the lawn grass begins to look overrun and bushy. 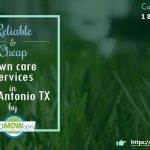 If you prefer to use an affordable Austin lawn mowing service, try out GoMow Lawn Mowing Service. We have all it takes to give your lawn the best lawn mowing treatment. A lawn mower in prime condition makes for an easy mowing activity whenever you need to mow. A lot of lawn owners neglect to maintain their lawn mowers. This includes cleaning the mechanical parts, oiling them and keeping the blade sharp. Dull or bad blades can cause more problems for your lawn grass. It is a known fact that blunt blades tear and rip lawn grass rather than give a clean cut during mowing. To keep your lawn mower in a good condition, it is best to clean, dry and store away in a cool dry place after each mowing session. In addition, oiling the movable parts is a good practice to keep the machine working fine. Your lawn mower blades deliver better mowing when sharp. 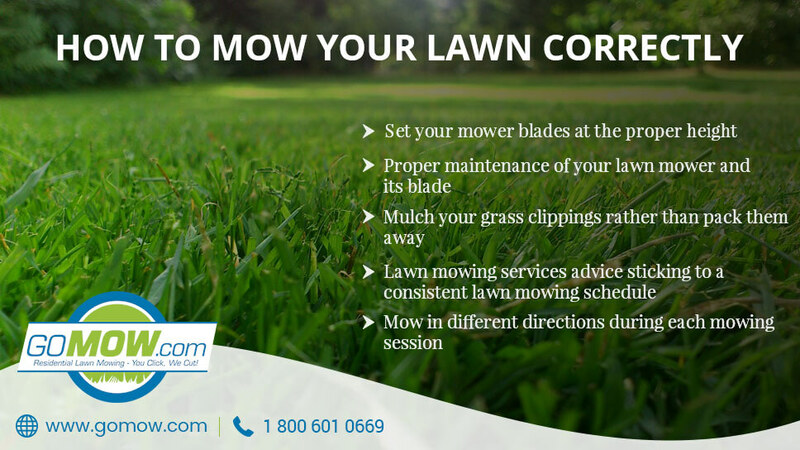 If you can’t sharpen your blades yourself, a good number of GoMow lawn care services in Austin also offer extra services covering lawn mower maintenance. Alternatively, you could simply change the dull blade by getting a new one as it is quite affordable. Grass clippings can serve as a very rich source of organic fertilizer when mulched back into the lawn. Usually, after mowing, grass clippings are usually packed off to be disposed to elsewhere. There are two ways grass clippings can be useful; it can be left on the lawn right there after mowing or it can be bagged and used to make compost later. Whichever way you go about it, grass clippings remain an ideal source of rich, natural fertilizers for your lawn. To get your grass adequately cut and mulched, a mulching mower is advised. It cuts through grass and mulches it at once leaving fine bits of grass matter that decompose easily on your lawn. Even if you choose to use a lawn mowing service near you rather than do it yourself, insist on the use of a lawn mulch mower. Lawn mowing isn’t the most enjoyable activity but it still has to be done by someone. This is where using an affordable lawn maintenance Austin TX comes into play. You need consistency if you want your lawn looking great. You also need it to be affordable too. GoMow Lawn Mowing Service, Austin makes this possible for every lawn owner in Texas. Our services are highly professional and yet affordable! With a professional lawn mowing service working with you, you can have that lush, green lawn of your dreams. Constantly mowing in one direction means you might end up having an uneven lawn surface. The better way to mow your Austin lawn grass is to alternate your lawn mowing direction during each mowing activity. Mowing this way will keep your lawn height level and the grass growing evenly. 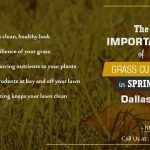 In conclusion, these 5 best Austin lawn mowing tips give excellent results when put to work consistently. Owning a lawn is only the first part of lawn care, keeping it healthy and beautiful requires hard, smart work and this is where we come in as professionals. 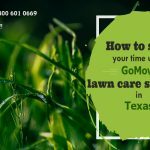 Contact us today at GoMow Lawn Mowing Service Austin in Texas and click below to get a quick free quote for lawn care services.